Hi. First, thanks for this layout, I love germanium ODs. 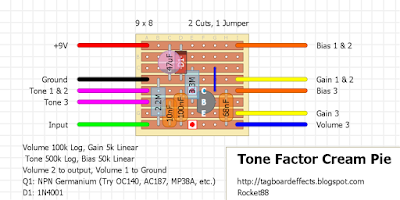 Can i use the third layout with charge pump and use a bias pot wiring the pot in the same position of the trimmer? Sorry my poor english. you should be able to. just put the bias pot in like the bottom layout and you should be good to go. 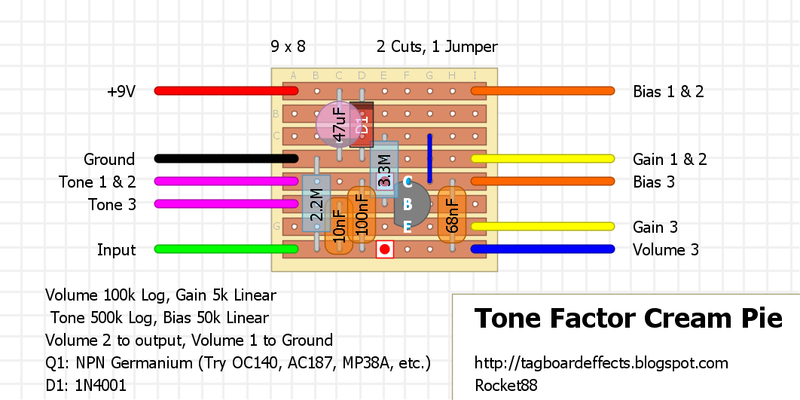 Looks fun... Can you verify cuts in each layout? Seems to be some discrepancy. Thanks for all the great work you do!! if you're talking about the cut under the trimmer, it's not really a discrepancy, cause tbh it's not really needed. it was left there after moving stuff around and was needed at one point. i'll make the change to the boards so it's not confusing. It was no issue for me, (all of them said 3 cuts, one was 5 one was 2 and one was 3) just wanted to clear it up for any future visitors :) Pretty cool little boost. The NPN version is verified. 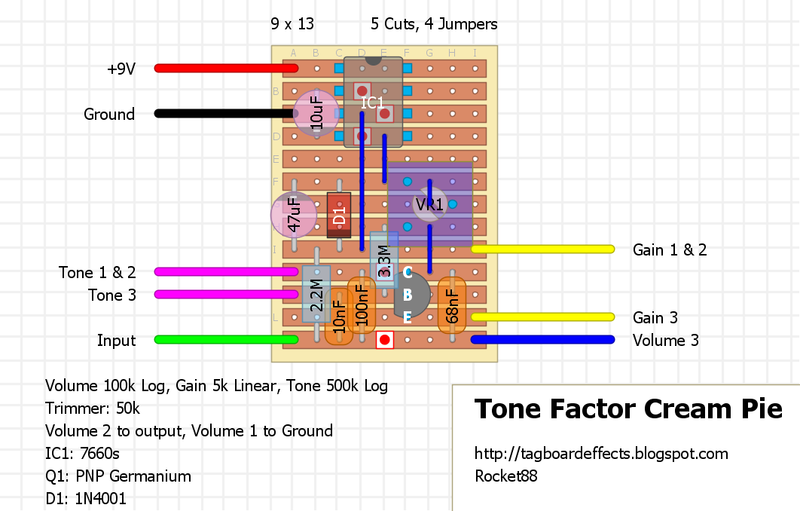 Tone pot seems to have most of it's usable range at the end of it's clockwise turn...will play with that a bit...otherwise smooth OD. Thanks again. Have a great day! great. thanks for verifying. you could always play with the input cap(10nF) and the tone cap (100nF) to change the frequencies affected. would a 2n2222a work in the #1 build? Sounds great with a 2N1304a with a gain around 55.
dumb question from a new builder here, but where is the board output for me to connect the footswitch? 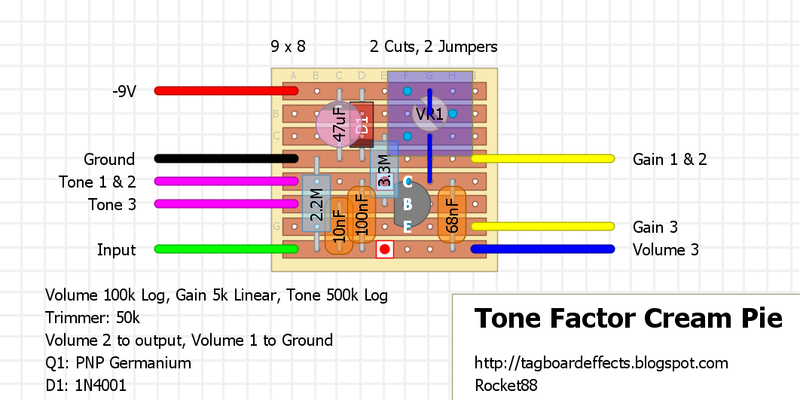 every layout will state in the build notes on the bottom where things go that aren't mentioned on the board, and/or do not have wires directly on the board. in most cases it's lug 2 of the volume pot. it appears that the notes got cut off, and didn't notice since it's been verified. i'll have to go back to change the spacing and make sure they're there. 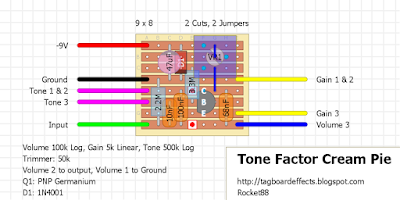 since the notes are MIA remember lug 1 of the volume pot goes to ground. thank you, Zach, that's very helpful!